Arjia Rinpoche was the Abbot of Kumbum Monastery, one of the six great centers of Buddhism in Tibet. He left Tibet in 1998 because of the repression of Tibetan culture and religion. He now lives in the United States where he remains devoted to his work as a scholar and teacher. In the year 2000, the Rinpoche established The Tibetan Center for Compassion and Wisdom (TCCW) to preserve and celebrate Tibetan language, arts, and to advance understanding of Tibetan Buddhism in the West. He hopes that in future years he will be able to assist in facilitating dialogue between the government of China and the people of Tibet. Rinpoche is the only Tibetan high lama of Mongolian descent. He was born in Eastern Tibet where as a young boy he was recognized as the reincarnation of Lumbum Gye, father of Tsong Khapa, the founder of Gelugpa (Yellow Hat) sect of Tibetan Buddhism. Since a very early age, he has trained with lineage teachers, including His Holiness the Dalai Lama and the late Panchen Lama, from whom he received many initiations and empowerments in sutric and tantric traditions. Rinpoche is fluent in Tibetan, Chinese, and Mongolian languages and has become quite adept at English as well. In the Tibetan tradition, Buddhist scholars also devote themselves to an artistic discipline unique to their culture. The Rinpoche excels in a number of art forms as well as architectural design. Employing traditional Tibetan Buddhist design, he oversaw the renovation of Kumbum Monastery, built a 80x40-foot three-dimensional Kalachakra Mandala, and restored the Stupa of Lama Tsong Khapa and the Golden Temple Monastery in Xining, Tibet. Since arriving in the U.S., he has designed a Buddhist Temple in Santa Cruz, and he and his assistants built a three dimensional Kalachakra Mandala which was dedicated to world peace and presented to His Holiness the Dalai Lama at the 25th International Kalachakra Initiation. This mandala has been exhibited at the Smithsonian Institute in Washington D.C. and presently resides at the Tibet Center in New York. Arjia Rinpoche's wise and generous spirit is visible to everyone who encounters him. He has inspired interest in Tibetan culture, Tibetan Buddhism, and the activities of his Center among growing communities of Tibetans, Mongolians, Chinese, and Americans throughout the country. He regularly teaches and leads meditations at the Tibetan Center for Compassion and Wisdom (TCCW) in Mill Valley and in Oakland, and has spoken to students at all levels of education throughout San Francisco Bay Area. He has been invited to speak about Tibet and Tibetan Buddhism for special engagements in New York, Washington D.C., Denver, and Los Angeles, and in 2001, he spoke on behalf of the Tibetan people for the U.S. Commission on Religious Freedom. 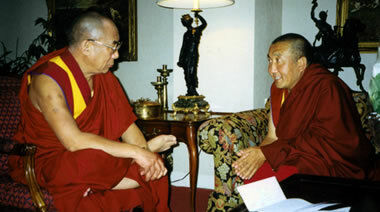 In November, 2001, he was invited to serve as a member of the Board of Directors of the International Campaign for Tibet in Washington D. C. Following September 11, Rinpoche organized a Marin County multi-denominational day of prayer led by representatives of ten different religions. His other greatest hope for his work in the United States is to cultivate awareness of the shared beliefs of the world's great spiritual traditions.